A trip to Hershey, Pennsylvania is not complete without the taste of chocolate, and the Hersheypark themepark, ZooAmerica, and Chocolate World, all fun attractions for everyone in the family. Chocolate lovers will enjoy a stroll and the enticing aroma of Chocolate and Cocoa Avenues where the street lamps are shaped like Hershey’s Kisses. When you’ve had enough candy, there’s even more to do in the surprisingly entertaining chocolate capital of the world. The major paths winding through this 23-acre outdoor garden are paved and stroller-friendly. A major highlight is the creative Children’s Garden, an interactive area with 30 different educational themes to explore, including counting, spelling, and telling time. With plenty of creatures and areas to play in — as well as frequent teacher-led programs — this is a calming place to let loose some youthful energy. The Butterfly House, open all summer with weather permitting, houses over 300 of the beautiful insects of over 25 different varieties, and features “flight attendants” who guide visitors through the story of a butterfly’s life cycle. Hershey is very close to Harrisburg, Pennsylvania, the state’s capital, and Harrisburg’s City Island is the base for an old-fashioned paddlewheeler offering rides on the Susquehanna River. The Pride of the Susquehanna has been operating public cruises for many years, and during the summer months, cruises depart daily except for Monday. This could be a great way to cool off on a hot day, or to check baby’s first boat ride off the list. Be sure to call ahead to confirm schedule and check availability. Also inquire about the company’s dinner/entertainment cruise options. The Hershey Museum has been replaced with the Hershey Story, a museum focusing less on the history of the company and more on Mr. Hershey himself. While this is filled with a lot of educational facts, the Hershey Story still has lots to make a visit fun. Check out the Chocolate Lab which gives visitors a hands-on experience in how to make chocolate. Then, go on a chocolate-tasting, where you can sample chocolate from Africa, Indonesia, Mexico, and more. A singing conductor might be a bit hokey, but that’s part of the fun as you tour around town in an old-fashioned trolley. Conductors point out notable landmarks along the way. Those who are interested in Milton Hershey history will want to go along for the ride. Keep an eye out for those Kiss-shaped street lamps! Vintage car lovers in your family will definitely want to stop by the Automobile Club’s museum, which features old automobiles in time-appropriate scenes and settings. There are even some “celebrity” vehicles, like the bus from Forrest Gump and Matt Damon’s car in the movie The Good Shepherd. Want to take a break from chocolate and pursue some peanuts and Cracker Jacks? One fun way to mingle with the locals when you travel is to attend a minor league baseball game, and nearby Harrisburg has a popular team, and seats are cheap. If you have more than a few hours to spend in Harrisburg, you may want to coordinate a game with a paddlewheeler cruise (see above), since both activities operate from City Island. Hersheys’ 11-acre walk-through zoo offers a home to more than 200 animals. The facility provides care for all the animals and includes specially designed areas for quarantine, infirm care, surgery and x-ray procedures. Enter from inside the Hershey Park on the same day and your visit will be free. 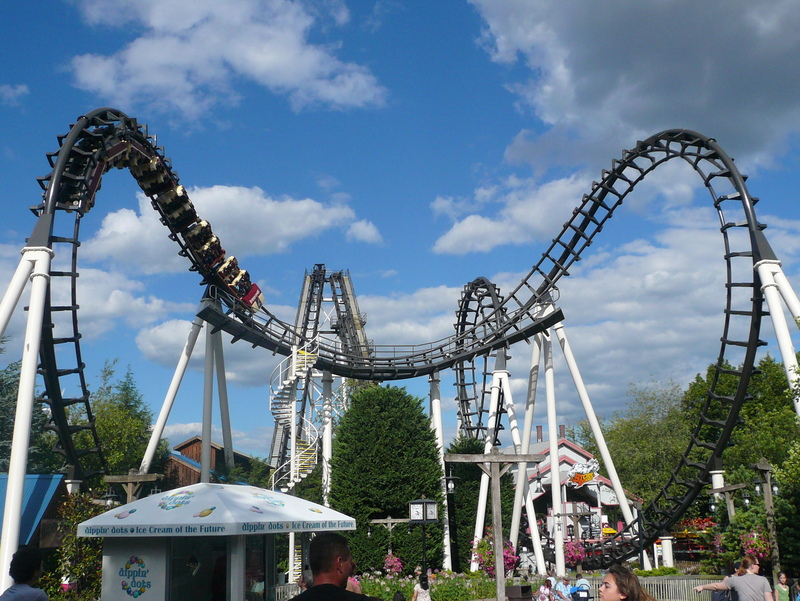 Hersheypark is filled with spectacular rides and attractions, making it a fun day out for all ages. Attractions range from a hand-carved carousel dating from 1919 to “Tidal Force,” one of the world’s largest, tallest, splashdown rides. Enjoy drenching water rides, roller coasters, live entertainment, and a chance to take pictures with Hershey characters. Try your chance at challenging games that test your skill, and stop for pizza or pierogies as a prelude to a chocolate dessert. And you can’t leave without trying the Reese’s Xtreme Cup Challenge. This high energy laser game pits car against car in a competition for the highest score. For old-fashioned, boardwalk-style fun, be sure to spend some time in the Midway America area of Hersheypark for rides, games, and food galore. You’ll find everything from a Ferris Wheel to a Wildmouse to Dippin Dots. This year families can enjoy the Shoreline Sprayground along with two waterslides at The Boardwalk waterpark. This recently added attraction allows people of all ages to enjoy the world of chocolate and be entertained by watching a simulation of how Hershey’s chocolate is made. Free to everyone, you can tour the factory, have complimentary samples, and participate in a 4-D mystery show where you can enjoy an animated and sensory adventure on the big screen. The Great Chocolate Factory Mystery in 4D allows audiences to interact with digital characters in real-time, effectively determining the direction of the show with over 100 possible outcomes. Featuring ground-breaking technology from the famous Jim Henson’s Creature Shop (of Muppet fame), this attraction of digital puppeteers is devoted to making a unique experience for the whole family that indulges all their senses and their super sleuthing skills. For an even sweeter memory and souvenir all-in-one, take the kids to the Hershey’s Create Your Own Candy Bar attraction where guests move from station to station in a real working chocolate factory to build the Hershey bar of their dreams. Shops and restaurants are available for the sweet fix you will inevitably need after all this chocolate celebration. For info on all attractions call 800/HERSHEY or visit Hershey PA Tourism.